Shanghai Tower is a huge skyscraper that is currently being built in China’s biggest city. When completed in 2014, Shanghai Tower will be the largest skyscraper in China and the second largest building in the world. The tallest building, the Burj Dubai, was opened in 2009. The new Chinese skyscraper will be 121 stories tall and will rise over 600 meters into the sky. The construction market in China will be a booming business area over the next two decades. Six of the world’s fifteen tallest buildings are already in China and many more are being planned. Today, the focus on constructing tall buildings is slowly shifting from North America, the birthplace of skyscrapers to countries in the Third World. Construction of huge buildings is already under way in India, Brazil and Saudi Arabia. By 2012 only 18% of the world’s one hundred tallest buildings will be in North America. 45 of them will be in Asia, 34 in China alone. One of the reasons for China’s construction boom is that the expanding cities need more space. Another reason is prestige. Chinese mayors want a status symbol that shows wealth and prosperity. A tall building in the city’s centre is exactly that. So many Chinese cities are completely restructuring their old overcrowded downtown areas and replacing them with modern high-rise buildings. Most of the planning is done by American firms, which regard China is their biggest market. 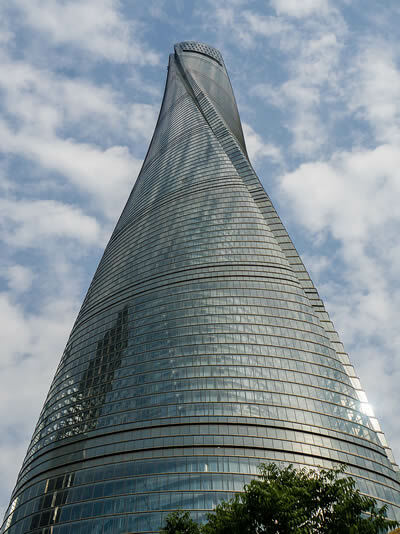 Chinese skyscrapers are more multifunctional than American ones. Instead of creating a single office building Chinese high-rises have shopping malls on the lower floors, office rooms in the middle section and luxury apartments at the top. The government, howeve,r is making some restrictions and telling constructors to build the tall buildings as friendly to the environment as possible. Windows in the Shanghai Tower, for example, will have two layers of glass that is expected to keep it warmer during the wintertime. Chinese city planners are not worried about getting people into such tall skyscrapers. The demand for space in is big and especially foreign companies are eager to move into such skyscrapers as the Chinese economy keeps expanding.